I had a lot of fun playing with J. Herbin 1670 Emerald of Chivor yesterday, so I decided to stay on the 1670 train another day and play with J. Herbin 1670 Caroube de Chypre. I purchased my sample from Vanness Pens. Caroube de Chypre is a red-brown with gold shimmer and bright green sheen. Holy green sheen batman! I had no idea this ink could sheen like this. Water resistance: Medium-a lot of the ink washed away, but you would probably still be able to figure out what it said. Other properties: Low shading, medium green sheen, and gold shimmer. The shading showed up on all three papers, the sheen only showed up on Tomoe River, and the shimmer showed up on all three papers as well. Sheen can be a bit tricky, even if you keep the ink and the paper consistent, the nib can make a big difference. On Tomoe River, using a medium Vanishing Point, which has an average flow, I didn't notice sheen, but when I tried a medium Pelikan m800, which has a wetter flow, there was sheen. On 32 pound copy paper, the ink behaved really well, even showed a little bit of the shading, but didn't show any of the sheen. Ink swabs for comparison, left to right (top to bottom for mobile RSS): Robert Oster Golden Brown, J. Herbin 1670 Caroube de Chypre, and Montegrappa Coffee Brown. Click here to see the J. Herbin inks together. Diamine Ancient Copper, Pelikan Edelstein Smoky Quartz, and Sailor Jentle Doyou. Click here to see the brown inks together. I used a Pelikan m800 Brown Renaissance with a medium nib on Tomoe River paper. 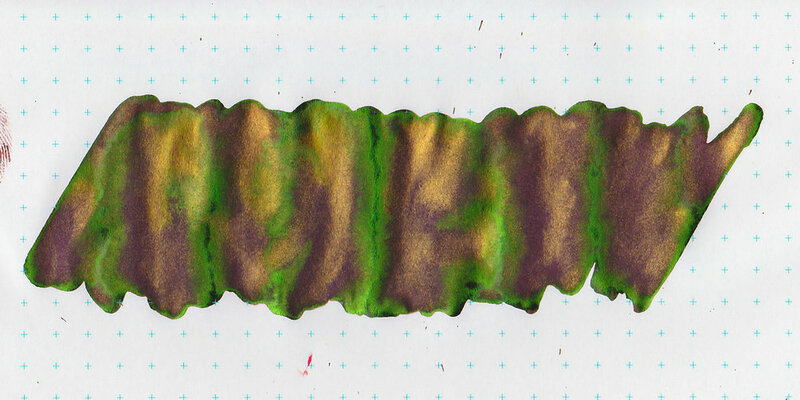 The ink is a little bit on the wet side, but not as wet as J. Herbin 1670 Emerald of Chivor. I love this ink/pen/paper combo. The nib and the ink are both on the wetter side, so it shows some of the green sheen on the TR paper. The shimmer is not super consistent-the first line or two have more shimmer, and then there are spurts here and there, even if you frequently shake or turn the pen to keep the shimmer particles in suspension. Overall, I like the ink a lot more than I though I would. I love it in the Pelikan m800. I think it's one that will be a great fun/art ink, but not one that I would use everyday-it's annoying to have to constantly rotate the pen to keep the shimmer flowing. Give it a try-you might love it.